EL SEGUNDO — Even with the time away from basketball, D’Angelo Russell spent Sunday in his first practice in over a week showing his lack of limitations. Despite missing the past three games with a mild MCL sprain in his right knee and a strained right calf, the Lakers’ second-year point guard completed all of Sunday’s practice without any restrictions. He reported that he felt “good” and did not feel any rustiness. Most of the shots during the end of the practice went into the basket. Even if the Lakers (16-34) technically have listed Russell as questionable for Tuesday’s game against the Denver Nuggets (21-25) at Staples Center, both Russell and Lakers coach Luke Walton sounded optimistic he will play. All of which prompted Walton to offer a playful dig to Russell. “You’re moving so well I’m surprised that you couldn’t play 3-on-3 yesterday,” Walton told Russell. The Lakers technically had the day off on Saturday, though plenty of players reported to the team’s practice facility for informal work. Since Russell felt his knee hurt too much to play in 3-on-3 drills, he spent Saturday working out in the weight room and completing sprinting drills. Still, Russell does not expect to experience rustiness as he did when he had missed 13 games earlier this season after having a non-invasive procedure on his previously sore left knee. During that time off, Russell watched some painful developments. Last week, the Lakers suffered their most lopsided loss in franchise history in a 49-point defeat to Dallas. Although the Lakers became more competitive in road losses this week to Portland and Utah, they heavily missed Russell’s absence. 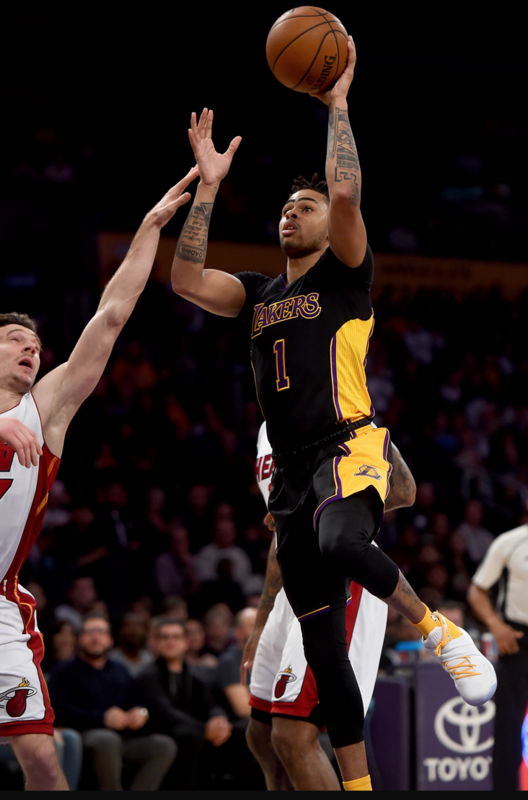 While Lakers rookie Brandon Ingram posted six points on 2-of-12 shooting as a starting point guard last week to Dallas, he moved back to the second unit and went scoreless on a combined 0-of-11 clip in the past two games. In two starts in Portland and Utah, Lakers veteran guard Jose Calderon also went scoreless and missed a combined six shots. Once Russell returns, can he match and elevate his season-long averages of 14.3 points on 39.6 percent shooting and 4.4 assists? That goes beyond producing. The Lakers have wanted Russell to fill the leadership vacuum that no one took ownership of during his absence. Russell came under scrutiny with that during his rookie season over his maturity and work habits. While the Lakers would like to see more refinement in those areas, they have reported relative improvement with Russell’s approach. That explains why Russell has tried to improve his leadership through action instead of words. Walton liked hearing that. He added he “absolutely” has seen Russell fulfill that job description.